It’s tough to survive today’s economy without credit. Lots of businesses consider your credit history, even those that don’t directly loan money to you. For example, utility service providers look at your credit history because they “loan” a month of utility service to you and require you to pay afterward. 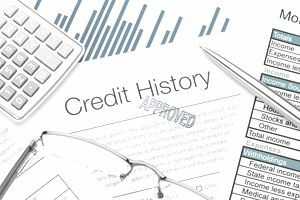 Without a good credit history, a utility service provider may require you to pay a high-security deposit to establish service. You’ll need a credit history as soon as you’re out in the real world opening accounts in your own name. Building a good credit history before you actually need it will make life much easier. Here’s how to get started. Step 1: Get a job. Your employment status doesn’t directly impact your credit; it’s not one of the five key factors that influence your credit score. However, having a steady income is a prerequisite to a major component in building credit – borrowing money. Step 2: Borrow money either by taking out a loan or opening a credit card. Once you have a job and you’re 18, you can apply for a credit card or loan. Establishing the very first credit account can be hard, but there are some tried and true methods like retail credit cards, a secured credit card, or a joint credit card. Your bank or credit union may be willing to give you small installment loan or credit builder loan, especially if it’s secured by a savings account. Step 3: Pay and wait. Once you have an account in your name and you use the account wisely, your credit begins to build as your creditor reports your account history to one or all of the three major credit bureaus. This monthly credit reporting establishes your credit report, the document businesses use when they’re deciding whether to extend credit to you. After your account has been active for six months, a FICO score can be generated based on your credit report. Your score may be low since you’re just starting out, but it’s better than nothing. Be patient because your credit score is being built. Your credit history will get stronger as your accounts get older and as you open more accounts. How you handle those accounts will determine whether you build a good credit history. Following two basic rules will help you build a good credit history. First, pay your bills on time every month, even those that aren’t listed on your credit report. This one of the reasons that having a job is critical to building credit. Without a steady income, you don’t have a guaranteed way to make your payments each month. Missing payments will hurt your credit building efforts and lead to a bad credit score. Second, only borrow what you can afford to repay. If you take on more than you can handle, you may have trouble making payments and if you fall behind, you can destroy your credit history. What you can afford to repay depends on your income and your expenses. People who make more money and live below their means can afford to borrow more. On the other hand, if you have a low income and little money left over after the bills are paid, then you can’t afford to borrow much. Building a credit history isn’t hard to do. It simply requires you to borrow money from a business that regularly reports to the credit bureaus. Practice responsible borrowing to build a good credit history and you’ll rarely ever have credit problems.